The Edgefield County Historical Society traces its beginning to the year 1939. In that year, inspired by the planning for the Centennial Celebration of the Edgefield County Courthouse which occurred in July of 1939, Mrs. Agatha Abney Woodson, a longtime local historian, brought together a group of Edgefield leaders to found the Society. The Society is believed to be one of the oldest, if not the oldest, county historical society in the State. 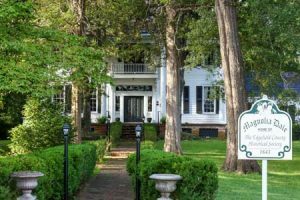 The Society will celebrate its 75th Anniversary with a Gala Reception on Friday evening, September 12, 2014 at its headquarters, Magnolia Dale, at 320 Norris Street in Edgefield. The event, which will be “black tie optional,” will begin at 7:00 and feature cocktails and a light supper with musical accompaniment. The public is invited. Tickets are $50.00 per person and can be obtained by calling the Society at 803-637-2233. The initial meeting of the Society was held on Tuesday, June 27, 1939 at the home of Mrs. Woodson on Church Street. Dr. Robert L. Meriwether, Professor of History at the University of South Carolina, had been invited to meet with a group of citizens who had an interest in county history. An encouraging number turned out, including Miss Sarah Collett, Mrs. Sadie Hollingsworth, Mrs. Helen S. Nicholson, Mrs. J. L. Mims, Mrs. Frank Warren, Mrs. Warren Fair, Mrs. Allene Wright, Mrs. P. M. Feltham, Mrs. M. N. Tillman, Mrs. P. P. Blalock, Jr., Mr. J. Hord Allen, and Prof. Edwin Folk. Many others sent in their names to become members in case the organization was effected. Mrs. J. L. Mims called the meeting to order and gave reasons for the organization of an Edgefield County Historical Society. She then introduced Dr. Meriwether, author of the acclaimed The Expansion of South Carolina, 1729-1765, who acknowledged his Edgefield County roots and then went on to make many useful suggestions for the Society. A nominating committee submitted proposed officers for the Society as follows: J. Robert Tompkins, President, Mrs. M. N. Tillman, Vice President, and Miss Hortense Woodson, Secretary-Treasurer. The officers were elected and began serving their terms. In 1942 Mrs. Mamie Norris Tillman succeeded Mr. Tompkins as President and served until her death in 1962. At that time Miss Hortense Woodson became President and served until 1983 when she became “President Emeritus.” Dr. Hendrik Booraem was elected President in 1983 and served until 1988, when he was succeeded by Mrs. Joanne T. Rainsford. Mrs. Rainsford served until her death in 1997. Presidents since Mrs. Rainsford’s death were Ms. Carrie Monday, Mrs. Whitney Ellis, Mr. Stephen Tillman and Dr. Mary Altalo. Mr. William Morgan “Billy” Benton is now President, having been elected in 2011. Over the years since its founding, the Society has done much to preserve and promote the rich history of Edgefield County. From the time of its founding, it has published many scholarly pamphlets, booklets and books on a vast variety of subjects related to the history of Edgefield County, including the following: “Edgefield County Judges” (1942), “Nicholson and Allied Families” (1944), “Dr. William Bullein Johnson and the Organization of the Southern Baptist Convention” (1945), “Edgefield Remembers the Mexican War” (1948), “General James A. Longstreet” (1951), “The Mims Families of Edgefield” (1951), “The Martins of Martintown” (1953), “The Hammond Family” (1954), “Norris and Kindred Families” (1956), “The Devil in Petticoats” (1960), “Edgefield in the Revolution” (1976), “Horn’s Creek Baptist Church” (1976), “Methodism in Edgefield County” (1977), “The History of Education in Edgefield County” (1985), “The Life and Times of June Rainsford Henderson” (1989), The Early History of Johnston (1993), “The Life and Works of Hortense Caroline Woodson” (1991), Lovely Village of the Hills (2006), “The Life and Times of Broadus Michelle Turner” (2009), The Story of Edgefield (2009), “The Founding of Edgefield County” (2010), Slave Records of Edgefield County (2010), “The Life and Works of Braidwood Lester ‘Braidy’ Holmes” (2010), “Celebrating the Life of William Miller Bouknight” (2011), “Celebrating Halcyon Grove” (2011), “Celebrating Darby” (2012), “The Story of the Pine House” (2013) and “The Early History of Horn’s Creek Church” (2014). One of the Society’s most appreciated publications is the green Edgefield brochure with the map of the downtown which was first published by the Society in 2003 and re-published in 2008. It is currently being revised and reprinted. The Society has also sponsored a number of key events, including tours of historical homes in 1960, 1966, 1967, 1968, 1976, 1984, 2005, and 2013 and meetings featuring the life of Mrs. M. N. Tillman (1961), Pottersville (1981), Edgefield’s Brooks Family (1981), Edgefield Portraitist Eliza Mims (1982), the life of Miss Hortense Woodson (1983), Dr. Charles Goode Gomillion (1983), Symphony at Horn’s Creek Church (1991), “Falling in Love with Lucy [Pickens]” (2006), the Speaker series for the Pottersville Archaeological Projects by the University of Illinois (2011 & 2013), “The Moral Compass” and “The Devil in Petticoats,” historical plays performed at the William Miller Bouknight Theatre (2012), and numerous other historical presentations. It also put on “Showcase House” events for Carnoosie (1989), Magnolia Dale (1990) and the Marsh-Stark House (1991). One of the Society’s most popular events is the Annual Christmas Tour of Churches which is held each December. The Society has hosted or sponsored three major history conferences over the last two decades: In 1998 it hosted the annual meeting of the Southern Intellectual History Circle, the organization of the leading Southern History scholars from across the nation. Attending this meeting were C. Vann Woodward, Professor of History at Yale and one of the most renowned Southern historians of all time, Sheldon Hackney, noted Civil War scholar and then President of the University of Pennsylvania, and Drew Gilpin Faust, acclaimed biographer of Edgefield’s James Henry Hammond and now president of Harvard University. In 2001, the Society sponsored “The Edgefield History Summit Conference” in which approximately twenty-five nationally-recognized historians came and gave presentations specifically related to Edgefield history. In 2005, the Society hosted the annual meeting of the British Nineteenth Century Historians (BrANCH) which brought approximately thirty historians from Great Britain as well as a number of its American members to Edgefield. In February, 2015, the Society will again host the annual meeting of the Southern Intellectual History Circle. The Society acquired the Old Law Building as its first headquarters in 1949 and Magnolia Dale as its second headquarters in 1959, which it now maintains as a house museum. In 1993, it initiated the effort to construct a museum which culminated, with the assistance of the South Carolina National Heritage Corridor, in the opening of the Joanne T. Rainsford Discovery Center in 2004. In 2010 the Society took over operations of the Discovery Center from the Heritage Corridor and converted the east wing of the building into the William Miller Bouknight Theatre, which is now also used by the Edgefield County Theatre Company for its theatrical productions. The Society also sponsored, or participated in, the restoration of the Furman Monument (1975), the Welcome Mural on Main Street (1978), the restoration of the Brooks Square in Willowbrook Cemetery (1981), the erection of the Strom Thurmond Statue (1984), the establishment of the Old Edgefield Pottery (1992), the Village Blacksmith (1998), Carpenter’s Stand (2001), the acquisition and construction of the Edgefield History Park (2001), the restoration of Magnolia Dale (2009), the construction of the Dr. Arthur F. and Esther Goldberg Edgefield Pottery Groundhog Kiln (2011), and the construction of the caretaker’s cabin at Horn’s Creek Church (2014). Over the years the Society has also sponsored, or assisted other organizations in sponsoring, many South Carolina Historical Society Markers. In addition to its role in preserving and promoting the rich history of the County, the Society has always been committed to using our rich history to make Edgefield County more interesting and attractive to tourists and prospective residents and businesses so as to bring recognition and economic vitality to the region. Toward that end, it now operates the Discovery Center Museum, Magnolia Dale House Museum, the Old Edgefield Pottery, the Village Blacksmith and Carpenter’s Stand. It also sponsors the Edgefield History Class which has been meeting every Sunday afternoon at 3:00 p.m. for nearly twenty years. This Class is a casual gathering of persons interested in local history who discuss various subjects over coffee and cookies. The Class is currently being held at the Tompkins Library. For more information, call the Society office at 803-637-2233. In 2009 the Class authored The Story of Edgefield. It is currently engaged in writing The American Revolution in Edgefield – from Ninety Six to Augusta which the Society hopes to publish in the next several years. Thus, during its seventy-five year history, the Edgefield County Historical Society has brought much to the County in terms of historical and cultural interest and has promoted, sponsored and supported many efforts to make this county a better, more attractive and more interesting place in which to live or visit. We look forward to the next seventy-five years with enthusiasm and excitement, and we hope that all of Edgefield County will turn out to help us celebrate our seventy-five year history on September 12th. One Response to "The Edgefield County Historical Society Celebrates 75 Years"